In our studies about the economic consequences of increasing globalization, we were able to show that a deeper economic integration has positive growth effects for all participating economies. However, economic development in the least developed economies, the African economies in particular, is problematic. The recognition of the opportunities and challenges in African countries was also a topic of last week’s G20 summit in Germany. Participating in the international division of labor enables emerging and developing countries – as well as industrialized countries – to specialize in manufacturing products where each country has a cost advantage and to achieve the growth effects described in an earlier Blog Post. 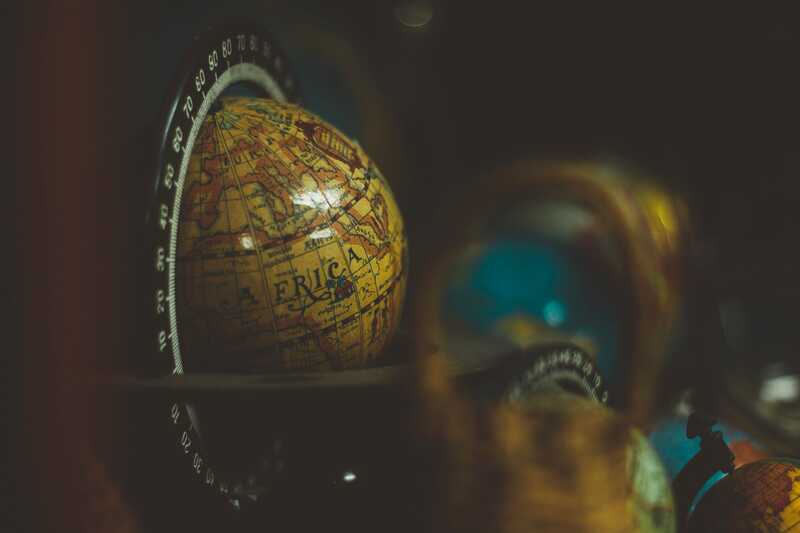 Furthermore, connections with the global economy provide emerging and developing countries with access to the loans and modern technologies they so urgently need. As a rule, foreign loans are necessary because where economic output and the material standard of living are low, domestic savings are usually too low to finance the construction of production facilities and infrastructure. Direct investment from industrialized countries plays a special role, because alongside financing, it also facilitates access to technologies. This results in positive economic effects for emerging and developing countries. Through foreign direct investment emerging and developing countries become more integrated into the global economy; this means that as a rule, inflows of foreign direct investment are accompanied by an increase in exports from and imports to the country receiving that investment. Overall productivity and national income increase in emerging and developing countries due to the higher capital stock and the technology transfer associated with it. The increase in national income is reflected in the higher GDP per capita. In the normal course of events, competition in emerging and developing countries will increase, because new providers arrive on the market. This leads to cost pressure, which is reflected in falling prices and allows consumer purchasing power in the destination country to increase. However, there are cases in which the entry of multi-national companies onto the market increases the market concentration in the target country. The reduction in competition associated with that is disadvantageous to consumers. That said, globalization should be considered as a positive development from the point of view of the emerging and developing countries, since GDP growth generated by globalization has an important role to play in the fight against poverty for those countries that are on the poverty threshold. Especially for the less developed countries, the reduction of poverty – or, more specifically, the reduction of absolute poverty – plays an important role. According to a broadly accepted international definition, a person is poor if he or she has less than USD 1.90 purchasing power parity per day. In 1990, the number of people living in absolute poverty worldwide numbered around 1.85 billion (35 per cent of the global population). In 2013, despite a larger population, only just under 767 million people were poor. This is 10.7 per cent of the global population. 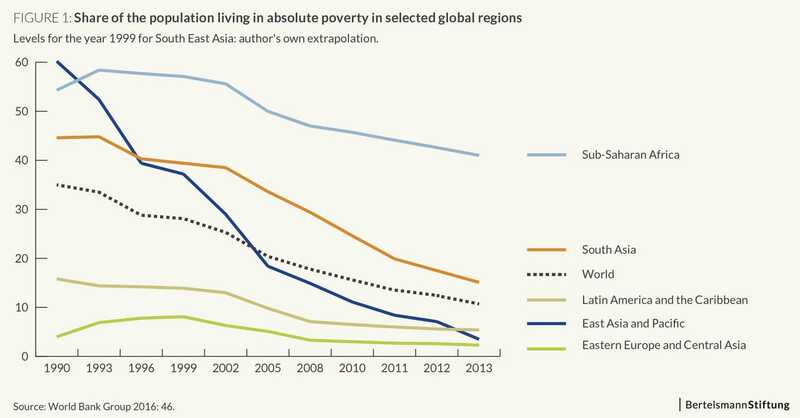 That said, absolute poverty varies a great deal from region to region. In developed industrialized countries there is practically no poverty in absolute terms. Economic growth in South East Asian economies, Eastern Europe and Latin America has led to a situation whereby no more than five per cent of the population in these regions is considered poor. In Sub-Saharan Africa however, the picture is quite different (See Fig. 1). The economic rise of East Asia, which is also attributable to greater integration in the global economy, is impressively demonstrated by the huge decrease in the share of people living in poverty in this region. While the share in 1990 was still 60.2 percent, by 2013 it had decreased to only 3.5 per cent. In Sub-Saharan Africa, the share decreased only from 54.3 percent to 41 per cent during the same period (see Fig. 1). The relatively low reduction in poverty in African economies demonstrates that particularly these least developed economies only benefit from globalization to a limited extent. The intensification of international trade leads to a situation whereby there is an increase in the quantity of goods and services which are produced and available to consumers in the countries involved. However, it is also possible that the increase in a country’s exports may lead to a drop in prosperity. If, while international trade grows, a country increases its exports, this raises the supply of goods on the world market. All things being equal, a greater supply of goods results in a reduction in the global market price for the goods in question. If such a drop in price is steep enough, it may lead to a reduction in export earnings despite the greater quantities being exported. This reduces the earnings available to the exporting country and thus lowers the standard of living in that country. This phenomenon, called immiserizing growth, is a risk for less developed economies in particular – economies which only export raw materials rather than any further processed goods (see Bhagwati 1958). Where a developing country exporting raw materials suffers falling export revenue, this usually goes hand-in-hand with a current account deficit. At present, this phenomenon is affecting countries in Sub-Saharan Africa in particular. The International Monetary Fund (IMF) has reported on the current accounts of 45 countries in this region. In 2015, 42 of those had a current account deficit, the highest of which were 30 per cent of GDP or more. At the same time, it is associated with foreign debt. If the current account deficit persists for several years, the developing country’s foreign debt continues to rise. Should international creditors lose confidence at some point and no longer extend further loans to these countries, it may lead to an economic crisis. Opening up borders for products from industrialized countries can lead to industries in the developing countries, which are not yet competitive, being crowded out. This prevents an effective industrial structure from being developed in those countries. Where such a situation develops, it is particularly problematic if agriculture in developing countries is confronted by competition from subsidized agricultural enterprises in industrialized countries. These subsidies distort competition in favor of the industrialized countries and can lead to a situation whereby farmers in developing countries are no longer competitive even in their own countries (see Giesbert, Pfeiffer und Schotte 2016: 8–9). As a result, this can lead the consumers in developing countries to rely upon products supplied by the industrialized countries, i.e. imports. For the developing countries affected, this means a decline in domestic production and employment, as well as the aforementioned current account deficit, together with external debt. The reduction of import tariffs in the course of advancing globalization is problematic for developing countries, in as much as import tariffs are an important source of revenues for the government in developing countries which do not yet have a functioning tax system. For example, in Sub-Saharan countries, import tariffs make up between ten and 30 per cent of public revenues (see Giesbert, Pfeiffer and Schotte 2016:9). By way of comparison, tariffs currently amount to less than one per cent of public revenues in Germany. The positive growth effects of advancing globalization are evident in emerging countries as well as industrialized countries. In particular, these effects are reflected in the steep reduction in absolute poverty in Asia, South America and Eastern Europe. By contrast, for the least developed economies in Africa, the results are less positive when the pros and cons of globalization are weighed up. In these countries, the share of the overall population living in poverty decreased from 54 per cent to only 41 per cent between 1990 and 2013. Furthermore, African economies are reporting high current account deficits, which indicates low international competitiveness. Considered in this way, African countries have been left behind by globalization. This development is also reflected in the fact that GDP per capita is growing more slowly in this region than anywhere else in the world. This means that the gap in terms of per capita income between Africa and the rest of the world has been consistently growing since 1980 – both in absolute and relative terms (see Tab. 1). Bhagwati, Jagdish. “Immiserizing Growth: A Geometric Note”. Review of Economic Studies (25) 1958. 201–205. Giesbert, Lena, Birte Pfeiffer und Simone Schotte. „Umstrittene Freihandelsabkommen mit der EU: Afrika unter (Handels-)Druck“. GIGA Focus Afrika Nr. 7. Hamburg 2016. World Bank Group. Taking on Inequality – Poverty and Shared Prosperity 2016. Washington DC 2016.